Trial By Sapphire: Identification, Please. 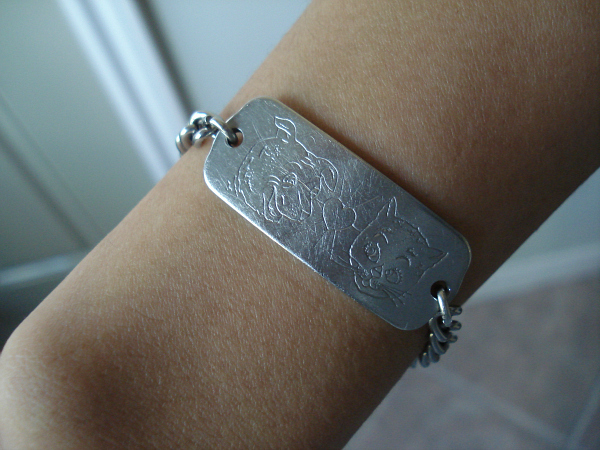 It's my ID bracelet from elementary school -- kindergarten, I think! My name, address, home phone number, and birthdate are stamped on the back. My sister and I still have our matching ID bracelets, and sometimes, we still wear them. What? You can't wear your childhood ID bracelets when you're 28 and 32? Says who? Now that handmade, handstamped jewelry is all the rage, it is clear that my parents are the epitome of fashion forward. I used to wear mine in college, mixed with whatever my favorite bracelets were at the time. Most girls at my school had Tiffany's, but I think my bracelet is way cooler than their cookie cutter heart-shaped bracelets. Right? RIGHT?! Also, my parents still live at the same address and have the same phone number, so in the case of an emergency, they can still be reached! My sister posted her bracelet on Facebook a few months ago, and it gave me the urge to wear mine again. I've been wearing it since December 29 and have only taken it off for these pictures and to go through airport security for our Leavenworth trip. I'm takin' this to the grave! 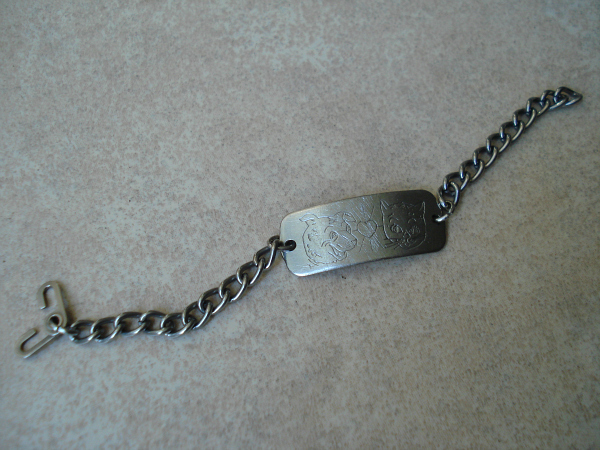 Did you have one of these ID bracelets when you were a kid? I am impressed you still have that! Seriously so crazy! I think it is So stinking cute actually! You take it to he grave sista. I never had one of these, but I love that you still have yours. It's way better than one of those Tiffany bracelets! That is adorable!! I love that there's a dog and cat on it. Foreshadowing ;) I never had anything like that! I've never had one of these but I love it! I would totally wear it if I did! OMG I just came across mine this past weekend!! My hubs wears it as a necklace he made... and I love it!! I have my Aunts, and I just think they're so cherishable!! ANDDD love that you have the same addy and phone number. How neat, I missed out. I totally did not have one of those!